As caring adults and parents, it is our responsibility to make decisions that will keep young people safe from harm. However, there are many decisions that affect the day-to-day lives of youth that aren’t related to their immediate safety. Young children can easily be involved in the process of making simple decisions for themselves, with guidance and support from adults. When discussing rules or other decisions, youth may express what they want, and adults can ask questions to help them think through the potential positive and negative consequences of those decisions. Through open communication with adults, children begin to understand how to weigh the pros and cons of any choice they make. Then, as the children demonstrate increased decision-making skills and responsibility, the adults may gradually allow the children greater input in choices that affect them. Because they started small and were later involved in increasingly complex decisions, young people will feel more prepared to take on these challenges. Youth who are included in the decision-making process – especially when those choices directly affect them – learn many important resiliency skills, such as healthy communication, responsibility, accountability, and critical thinking. They are also more likely to have a greater sense of independence and stronger “buy-in” to the results of those decisions, because they had a voice in determining their own future. Ginsburg, K.R. & Jablow, M.M. (2011). Building Resilience in Children and Teens. Elk Grove Village, IL: American Academy of Pediatrics. United States Department of Agriculture (2011). Essential Elements: 4-H National Headquarters Fact Sheet. Washington D.C.: 4-H National Headquarters. 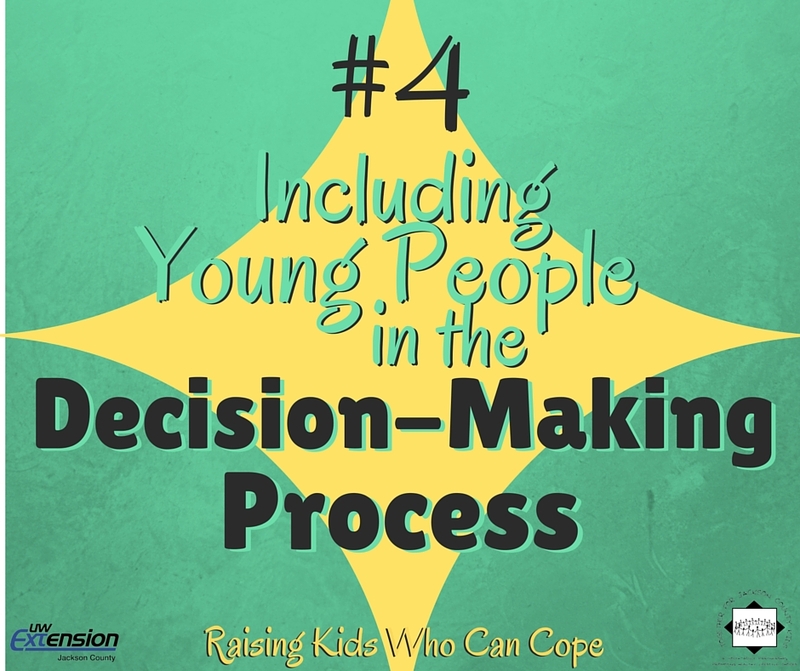 This entry was posted in Raising Kids Who Can Cope and tagged coping skills, decision-making, youth. Bookmark the permalink.